Nokia N81 make your music and gamning taken to another level! - Music: Spin the Navi Wheel and follow the multimedia menu to load and sync tunes easily. Store about 1600 songs and get high quality sound using your favorite 3.55mm headset. - Gaming: Discover N-Gage and enjoy portrait or landscape play with dedicated game keys and challenge other gamers. - Memory: Store more of your media, music, videos, photos, and games with hot swappable microSD cards. --- Operation times may vary depending on radio access technology used, operator network configuration and usage. - Choose whether the Podcasting application uses wireless LAN (requires WLAN network access) or GPRS/WCDMA packet data (requires a packet data plan) to download podcasts to your Nokia Nseries device. - Get instant access to your favorite stations. 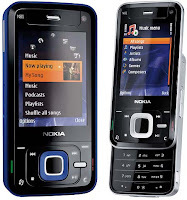 - Data transfer application for transfer of PIM information from other compatible Nokia devices.